January 2012 – on my way: make it someday. Hi there. Are you still there? Anyone? Have you missed me? Probably not. I’m afraid you’ve all given up permanently on reading anything here. Well, now that you mention it, not particularly. So now, only one cover letter away from the grad school application finish line, I’m coming back and offering you a picture of me skiing, inside a giant inflatable snowman lawn ornament with armholes and eyeholes cut out of it. This didn’t happen recently. I flew home for Christmas and was so happy to be back in New England, seeing my family and my dog (who was recovering from surgery like a champ) and many old friends. And then all too soon I had to come back to Oregon to do some fieldwork – we have weekly tasks, and while I could skip out on one week, I couldn’t miss two in a row. 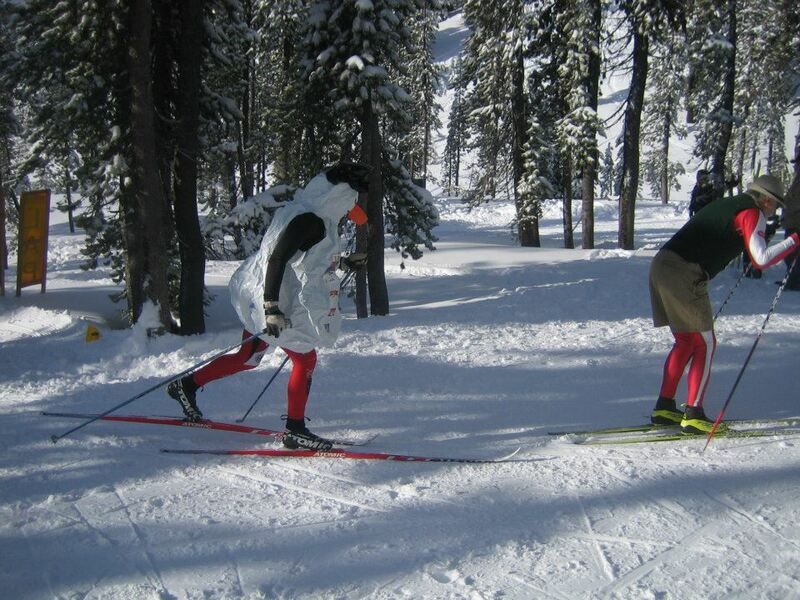 So I arrived on a Monday night, worked three days, and then took advantage of our New Year’s vacation and headed over to Bend with the South Eugene High School nordic ski team. The team is surprisingly large considering that there isn’t actually any nordic skiing to be had in Eugene. It’s a really fun group of kids, parents, and coaches, and so when they said they were doing an on-snow camp over in Bend over the New Year, I signed up to help out. The first surprise was when I woke up in the morning, saw that a blizzard was forecasted for the Cascades, and promptly received a phone call telling me that Janice, the head coach’s wife, had broken a crown and needed to get emergency dental work, so she couldn’t drive the van. I was the only other coach with experience driving in snow, so all of a sudden, I was going to be captaining an unfamiliar minivan full of giggling teenagers through a huge storm. Awesome. So, we slowly inched our way up to Mount Bachelor to find that they were not grooming due to the blizzard. It was windy and there was a lot – a LOT – of new snow. Wonderland, sort of. I was assigned to go on a jaunt with our star skier, Trevor, and impress some of my technique knowledge on him. We set out and it immediately became clear that technique work was NOT going to happen. Since nothing we could do would have been “good training” anyway, we went on an adventure, slogging around a six or seven kilometer loop down through the middle trails. We were essentially trying to stride, step, herringbone, or do anything to move forward on our skate skis through what was now almost a foot of new powder. It took us about an hour. It was fun, but I really wish we’d been on classic skis. I was silently cursing the other coaches and thinking, oh, right, waxing would have been hard but this isn’t!? The worst part of the afternoon was when we finished skiing and tried to pack the skis back into the roof boxes of the vans. It was blowing really hard – the temperature was about 25, but with the wind and snow and ice, it felt like it was 20 degrees colder. The boxes had iced up and were impossible to open, then impossible to close. Kids were shivering, yelling, in some cases almost crying in their wet workout clothes. I was almost crying. I was frozen. Luckily day two was sunny and the fresh snow had been packed down into perfect corduroy. We had a great day of training. That night was New Year’s Eve and I went into town to meet up with some college friends, Matt and Anna, who I hadn’t seen since graduation. The three of us had run together at Dartmouth before one by one quitting the team. Matt and Anna are married now, and were visiting Matt’s family in Bend for the holidays. It was great to hang out. The next morning I woke up not exactly hung over, but thinking that I probably should have skipped that last beer because wow, I didn’t feel awesome. The team was supposed to head up to the mountain for MBSEF’s annual New Year’s Relay, a fun event where costumes are encouraged. We figured all the kids would make teams and it would be great. The problem was, on Sunday morning none of them seemed very enthusiastic. We went from having every kid on a team – many had even brought costumes – to all of a sudden not having a single three-person team. Another coach and I charged in, saying we wanted to do the relay, would just one person do it with us? And got three responses. That gave us five people. We recruited vigorously and managed to get a sixth so we could field two teams. My team consisted of me, Natalie, and Langdon. Natalie had skied the year before and was pretty athletic. Langdon was tall and athletic, too, but had never skied before this weekend. He also had a costume, an inflatable snowman of the sort that people put on their front lawns, which he had cut armholes and eyeholes out of and dismantled the bottom so you could move your legs a little. There were also a series of small holes around the mouth so you could breathe a little bit. He was too embarrassed to wear it, though. So guess who did. That’s right. I’m pretty sure that I’ve never met a costume I didn’t like, and this was no exception. In a matter of minutes I was no longer Coach Chelsea, but…. Snowwoman! The course was just three kilometers, but it was deceptively hard – three one-kilometer loops going up and down and twisting around. I was the leadoff skier and given that I had no peripheral vision inside the snowman suit, at first I just tried not to get tangled up with anyone. Then I realized that I had extremely limited mobility – I couldn’t open up my stride and was stuck taking very short steps. When I double-poled, my arms bashed against the bulky middle of the snowman so I had to have a very wide stance. I also realized, pretty quickly, that the mouth holes did not line up with my mouth and that I was essentially trying to race with my head inside a plastic bag. It was hard, and I felt a little lightheaded, but it was fun. A lot of people cheered for me – “Go Snowman!” and “Wow, here comes the snowman already!” Apparently they don’t expect snowmen to be quick on their skis. And I wasn’t, particularly – I think I tagged off somewhere in the middle of the field, maybe the front of the middle. I quickly took the costume off and enjoyed sucking all the oxygen I could out of the thin 6000-foot-high air. My teammates did the best they could. Langdon really struggled, which was understandable given that he had basically never skied before. We dropped to last, but we didn’t care. Natalie and Langdon both said they’d had fun, and they had a sense of accomplishment that their other teammates, who hadn’t raced, couldn’t have understood. And me? I had a slobbery snowman suit. What a prize.